Anemia (U.S. spelling) or anaemia means not having enough red blood cells or hemoglobin in the blood. Methotrexate, zidovudine, and other drugs that stop DNA replication. This is the most common cause in nonalcoholic patients. Dimorphic anemia means two types of anemia at the same time. For example, macrocytic hypochromic, due to hookworm infestation leading to not enough of both iron and vitamin B12 or folic acid or following a blood transfusion. 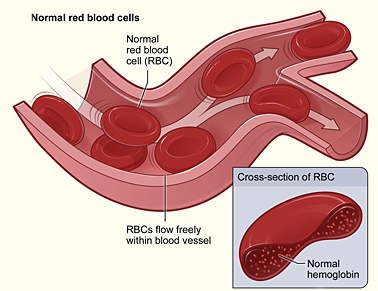 Figure shows normal red blood cells flowing freely in a blood vessel. The inset image shows a cross-section of a normal red blood cell with normal hemoglobin. Anemia Facts for Kids. Kiddle Encyclopedia.